Compliance Compliance Center UNIVERSITY OF WISCONSIN - MADISON The two main functions of the compliance office are to educate and monitor. 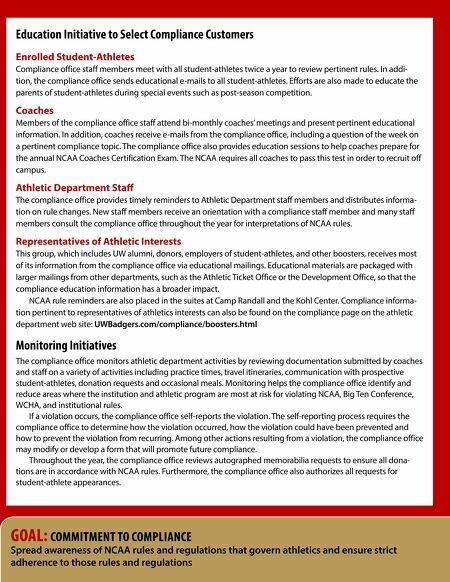 DEAD PERIODS W the compliance staff meets with and disseminates information to coaches, student-athletes and other staff, providing material on the sometimes complex application of NCAA and Big Ten Conference rules. The compliance office continues its comprehen- 2 0 1 3 Published Jan. 2, 2013 www.ncaa.org One of the key elements of NCAA President Mark Emmert's reform agenda is the deregulation of the Division I rulebook. The Board of Directors is poised to take its first votes at the NCAA Convention January 19 on a series of proposals designed to make the rules meaningful, enforceable and supportive of student-athlete success. Football January 1-3, 7-10 February 4-7 Over the years, the Division I manual has grown to include rules that many in the membership believe are best left to individual schools and conferences. The Rules Working Group is identifying those rules that are less national in scope and refocusing the rules-making process on a group of commitments that speak to the values and principles of Division I members. CC/Track and Soccer "Some of our rules are counterintuitive, outdated and just unenforceable. They don't make sense in the world we live in," Emmert said. "We are refocusing on the things that really matter, the threats to integrity, and the biggest issues facing intercollegiate athletics." Emmert emphasized that the goal is to shrink the manual by simplifying rules and focusing on student-athlete well-being . The following Q&A provides more details on the deregulation effort: February 4-7 ith respect to education, J A N U A R Y Breakdown of Division I rules changes NLI SIGNING PERIODS Football February 6-April 1 Why is the NCAA changing its rules? The goal of deregulation is to protect and enhance the student-athlete experience, shift the regulatory focus from competitive equity to fair competition and allow schools to use the natural advantages of geography, a talented student-athlete or deeper pockets. Over time, the rulebook has expanded to include rules designed to limit those things. The deregulation effort hopes to shift the focus from limiting the advantages of individual schools to making sure all schools compete within the framework of the collegiate model, in which athletics competition is an integral part of the student-athlete's education. Why focus on fairness of competition instead of competitive equity? The current justification for rules as creating a level playing field has produced too many rules that are not meaningful, enforceable or contributory to studentathlete success. The shift to a fair competition model acknowledges that natural advantages exist between campuses that cannot – and should not – be regulated. The changes are intended to better define what fairness means in terms of eligible student-athletes, scholarships, the length of the playing and recruiting seasons, and the number of coaches. Ultimately, retaining the current rules will not impede the competitive shift. CC/Track and Soccer February 6-August 1 REMINDER TO SUBMIT ANY PAST DUE FORMS Telephone Logs CARA Logs Athletic Participation Forms Why rely more on campus-level policies and procedures than rules for everybody in Division I? The Rules Working Group recognizes that some schools will be pressured to adopt policies and procedures to not place their program at a competitive disadvantage. The new rulebook would require that policies be in place in specified areas, that they address key components or campus values and that they will be followed. NCAA violations would occur if policies are not developed or followed. When will the rulebook be reduced in size? The deregulation process will begin this month, when the Board of Directors votes on the first round of proposals to come from the Rules Working Group. These proposals will make major changes in the way the NCAA views personnel, amateurism, recruiting and benefits for student-athletes. The working group will have a second round of concepts for membership feedback and review this spring. The result of these efforts may not necessarily be a significant smaller rulebook, but the rules will be vastly more meaningful and enforceable. Why does the NCAA have to do it this way? The NCAA is a membership organization. The Division I membership includes 346 schools and 31 conferences, representing a divergent group of missions, resource levels, public profile and student populations. Preserving this diversity is important to leaders within the division, and in order to do that, the working group strives to build consensus around its approach and the ultimate proposals it recommends to the Board for adoption. How will the NCAA make sure the rulebook doesn't get back to the way it was? Part of the Rules Working Group's goal is to develop a process by which each new piece of proposed legislation must pass a three-part test of being meaningful, enforceable and supportive of student-athlete success. The working group is taking this charge seriously and is in the early stages of developing a new process for rules-making. sive education program, utilizing various What if some of the deregulation turns out to have unforeseen consequences? The working group has proposed a two-year period in which the membership can digest the new rules. After that period, if some areas are identified in which the working group went too far toward deregulation – or didn't go far enough – changes will be considered. methods to increase awareness of NCAA, Big Ten, WCHA and institutional rules and to foster a 'compliance conscience.' 10 Total number of compliance forms student-athletes must complete each fall as part of the compliance check-in process Above: This educational piece was sent out to all UW athletic department staff to provide an update on NCAA rule changes. Below: Efforts are also made to educate UW fans via this page in the football game program, outlining the NCAA rules that every Badger fan should know. 2011 WISCONSIN FOOTBALL 2010 BIG TEN CHAMPIONS NCAA Guidelines NCAA Rules That Every Badger Fan Should Know With increasing numbers of NCAA rules governing outside intervention in recruiting, coaches cannot afford to have any extra "help" in recruiting elite student-athletes to the University of Wisconsin. The penalties are too severe. Here are some tidbits of information concerning you and Badger athletics. Who is a Booster? You are a "representative" of the UW's athletics interests (i.e., booster) if any of the following apply: • You are an alumnus of the University of Wisconsin; • You have ever made financial contributions to the athletics department, to an athletic booster organization of the UW, or to a UW athletics program; • You have ever helped to arrange employment of enrolled student-athletes and/or National Letter of Intent signees; • You have ever been involved in any way promoting the Badger athletic program. Once an individual is identified as an "athletics representative/booster," the person retains that identity forever, even if that person no longer contributes to or supports the athletics program. Who is a prospect? A prospect is any student who has started classes for the ninth grade. In addition, any student younger than ninth grade could become a "prospect" if they receive any benefits from an institution or a booster. Student-athletes enrolled in preparatory school, two-year colleges, or other fouryear colleges are also considered prospective student-athletes. UW Director of Compliance Katie Smith 134 What You Cannot Do Make in-person, on– or off-campus recruiting contacts with prospective student-athletes or prospects' relatives or legal guardians, including a prohibition on correspondence and telephone calls. If you are contacted by a prospect or a prospect's parents/guardians about UW Athletics please refer those individuals to the UW Athletic Department. What Can You Do? If you know of a prospective student-athlete who might want to attend the UW, the only permissible activity for a representative is to call the appropriate UW coach. Extra Benefit Rule In general, you may not provide anything or make any special arrangement for our studentathletes or prospective student-athletes, as well as their parents, relatives and friends. This prohibition includes, but is not limited to: • Providing the following to a student-athlete, prospect, their parents, relatives, or friends: ◦ Room, board, or transportation ◦ Entertainment (even nominal items, like food or beverages, are impermissible) ◦ Use of an automobile for any purpose ◦ Loan or arranging for or cosigning a loan ◦ An award or gift ◦ An honorarium for a speaking engagement ◦ Goods/services, even if purchased at face value, if the availability of those goods/ services is not legitimately advertised to the general public □ Tickets for any value • Employing relatives or friends of a prospective student-athlete as an inducement for the enrollment of the prospect. • Purchasing or exchanging complimentary admissions, athletic gear, awards, or autographed memorabilia from a student-athlete. According to NCAA rules, the University of Wisconsin Athletic Department reserves the right to withhold any benefit or privilege associated with their athletic department (i.e., booster clubs, ticket privileges, etc.) from individuals that are involved in a violation of NCAA legislation. Employment A representative of athletics interests is permitted to provide employment for student-athletes provided they don't use the student-athlete in advertising the business. Additionally, the student-athlete's compensation: • Cannot include any remuneration for value or utility that the student-athlete may have for the employer because of the publicity, reputation, fame or personal following that he or she has obtained because of athletics ability; • Can only be given for work actually performed, AND • Can only be at a rate commensurate with the going rate in that locality for similar services. With more than 700 student-athletes competing at the UW, the Department of Athletics encourages businesses to hire Badger studentathletes. Please contact Bridget Woodruff, UW's CHAMPS/Life Skills Coordinator at 608-8902021 or the UW Department of Athletics if you are interested in pursuing these opportunities further. For more information regarding rules and regulations, including additional information for alumni and friends of Badger athletics, please contact Katie Smith, Director of Compliance, at 608-265-5071 or kls@athletics.wisc.edu.